 Before Airships: Conquer the Skies, I spent several years working on another project, Space Exploration: Serpens Sector. This was a game about exploration and crew management heavily inspired by the first Strange Adventures in Infinite Space. I put a lot of work into it, but the result wasn’t really satisfying because I had neglected to create a good core game design. 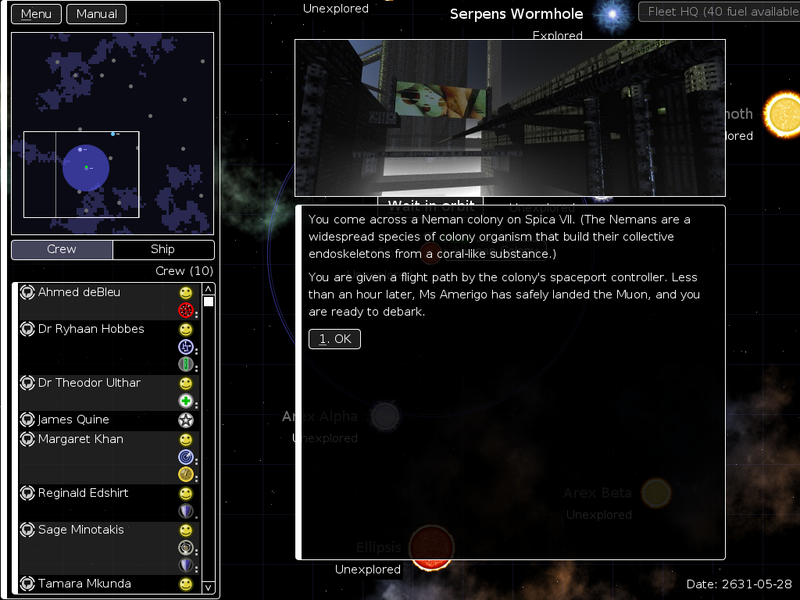 So I built up a complex UI and complex encounters too early, and each change became a lot of work. Eventually, I rebooted the development and started on a new, simpler prototype that concentrated on the core mechanics. Then Airships came along, a “side project” that pretty much instantly got more traction and interest than SE:SS. Within a few months, it became my main project. I was tired of going around and around with SE:SS and wanted something else. SE:SS was never exactly cancelled, just put way on the back-burner. This was four years ago. The other day I re-downloaded the source of the first SE:SS version and got it up and running, and I found myself pleasantly surprised. Yes, the core mechanics are probably ultimately not satisfying. Yes, it’s overcomplicated in places. But it runs, it’s perfectly pleasant to use, and there’s quite a bit of nice content. The pre-rendered graphics look kind of dated, but in a way that can plausibly pass as charming rather than hideous. 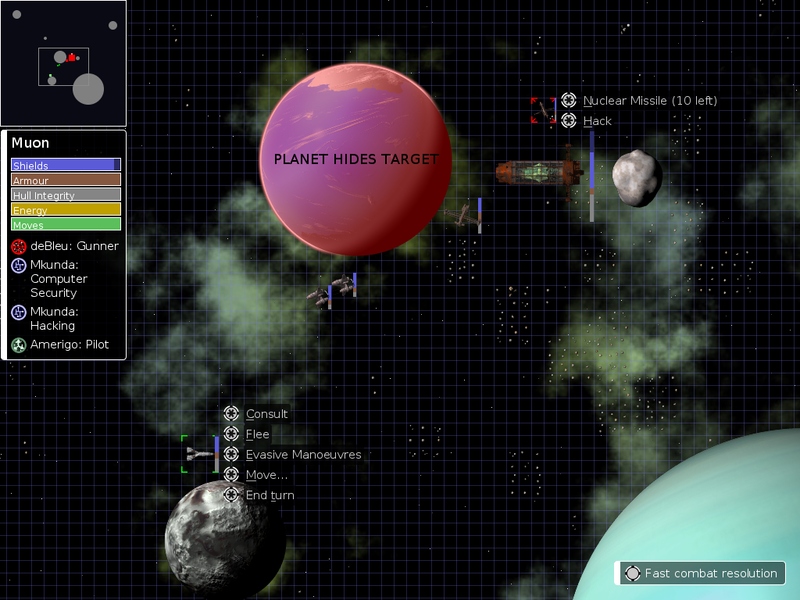 Fight enemy ships in a turn-based combat system: hide behind planets, navigate through asteroid fields, hack enemy ships, and use your crew’s special abilities. To be clear, if I take up work on the game again, it will not be on the basis of this build. The code is antiquated and overcomplicated, I have a much better idea of how to make the mechanics work, and most of all, all the auxillary files like 3D models, music projects, and Photoshop files are lost to the mists of time. It would be an entirely new code base, building on the lessons learned with this version and the subsequent gameplay prototype. It would incorporate the lessons from the second prototype and things I’ve learned since, about interactive fiction and game design and programming. This also means that this build is very much presented “as is”. I will not be providing any bug fixes or support. I’m happy to receive feedback about the game in general, and discuss its content, but any such feedback would end up being used in a future version of the game, not this one. So take this game, as a kind of isolated artefact of its time, an entertaining but flawed thing that went straight from alpha to abandonware.